Assemble your favorite cellar-dwelling vampire with The Munsters Grandpa Munster 1:10 Scale Model Kit! Once assembled, the sarcastic father-in-law to Herman Munster stands about 8 1/4-inches tall. 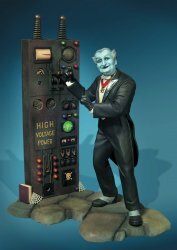 The wisest Munster comes with a cobblestone base and an equipment reading, "High voltage power." 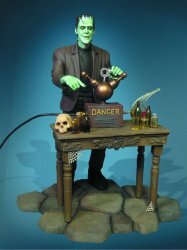 You can even combine the Grandpa Munster 1:10 Scale Model Kit with the Herman Munster kit (as shown but sold separately) for an even more spectacular decorative piece! Use the button below to order both.